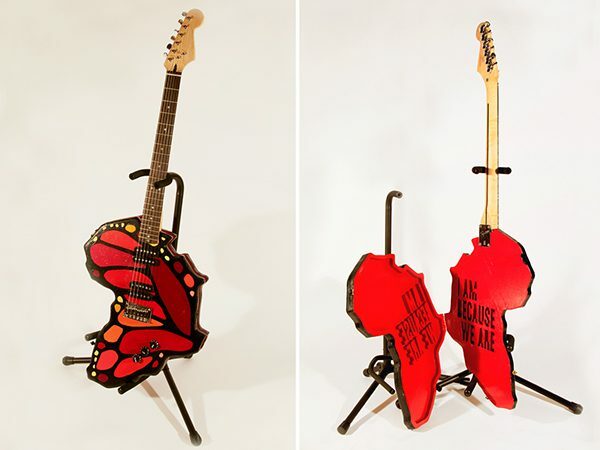 Our goal was to create a symbol for every child effected by this epidemic, in the image of a butterfly – beautiful, fragile, and longing to be free, with the message of Ubuntu on the inside “ I am because we are.” This is an interactive piece, when closed it looks like a Map of Africa, indicating the location of Malawi through the positioning of the guitar tone & volume knobs. When opened it becomes a butterfly. More photos here.